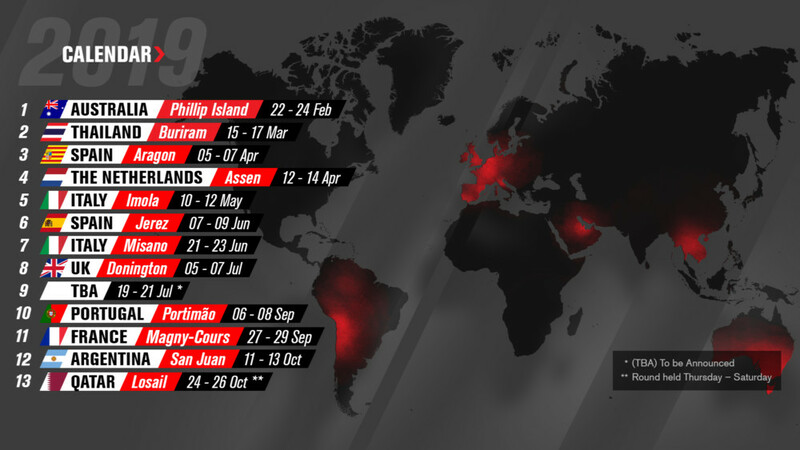 2019 is just around the corner, and the FIM and Dorna WSBK Organization have announced the 2019 MOTUL FIM Superbike World Championship calendar, with 12 rounds confirmed. Beginning with the traditional season opener at Phillip Island Grand Prix Circuit, fans will be able to see three WorldSBK races for the first time ever from February 22–24, before round two of the championship is held March 15–17 at Chang International Circuit. The paddock then returns to Europe on April 5–7 at MotorLand Aragon, welcoming back WorldSSP300 to the racing action with their all-new format for the season ahead. The next stop on the 2019 tour will be one week later at TT Circuit Assen from April 12–14, before a short break of racing action. Round five takes place at Autodromo Internazionale Enzo e Dino Ferrari di Imola May 10–12, before the return of the ever popular Circuito de Jerez Angel Nieto June 7–9. WorldSBK heads back to Italy from June 21–23 to the Misano World Circuit Marco Simoncelli for round seven, before a change of date for the UK Round at Donington Park July 5–7. After the British adventure, round nine is set to be announced. Autodromo Internacional do Algarve will be the now traditional round after the summer break, as the paddock heads to Portugal from September 6–8. The final European round will be held from September 27–29 at Circuit de Nevers Magny-Cours, but we won’t be saying goodbye to WorldSSP300 yet. Circuito San Juan Villicum returns for the second season October 11–13 in Argentina before all three classes will prepare for the season finale in Qatar at Losail International Circuit. The checkered flag will be waved from October 24–26 in the desert in what is set to be another adrenaline-fueled year of racing action. On top of this, there will be two official tests in 2019: the first from February 18–19 at Phillip Island Grand Prix Circuit, with a midseason test to be announced. Click here for all the latest Road Racing news.